Translation: For the BJP Sasand Manoj Tiwari, Delhi Police stopped the ambulance. In Ambulance the child was fighting with life and death. And finally, the child broke the breath!). The video showed that a bunch of police officers had barricaded a road for VIP movement. People had gathered around the police to protest for not allowing an ambulance to pass through. The ambulance had a child inside who was in critical condition and needed medical assistance right away. The video received 29K views and 2141 shares on Facebook. This particular video was posted from the Facebook page of NSUI Congress claiming that road was blocked for smooth movement of BJP politician Manoj Tiwari. 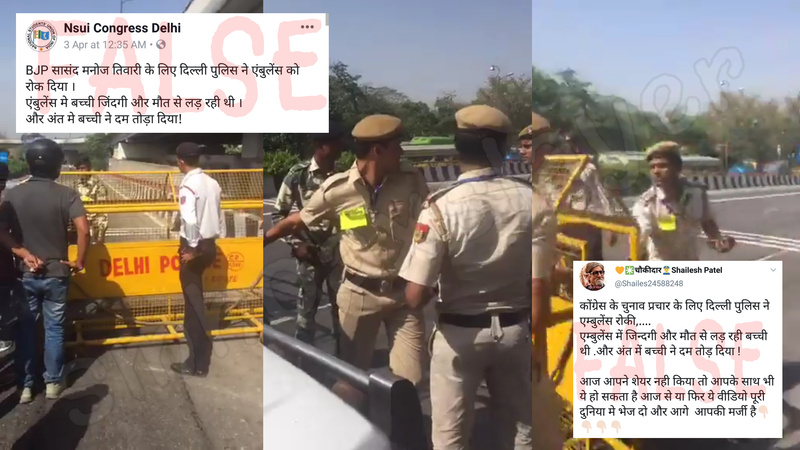 Hours later, Twitter user Shailesh Patel( Twitter handle: @Shailes24588248) posted the same video from his account claiming that Congress was behind the roadblock. Patel, by the looks of his Twitter account, seems like a follower of PM Narendra Modi and have posted lots of content related to BJP and Modi. This video has received 297 retweets and 210 likes. कोंग्रेस के चुनाव प्रचार के लिए दिल्ली पुलिस ने एम्बुलेंस रोकी,…. एम्बुलेंस में जिन्दगी और मौत से लड़ रही बच्ची थी .और अंत में बच्ची ने दम तोड़ दिया ! The video has become extremely viral on social media. Reaching out to great masses, this video act as a possible use of propaganda by political parties to put down the contenders and woo in voters for the upcoming elections. The same video has been used by two competing political parties under different captions. The original video was posted two years back on April 1st, 2017. It was posted by an individual, Preet Narula on Facebook. Narula works at South Indian bank in central Delhi. While he was on his way to work, he noticed cops have put up barricades near the Rajghat flyover for VIP movement of Malaysian prime minister’s cavalcade. This story was also covered by Times Of India on 5th April 2019. As quoted to Times Of India, Narula said “There were 40-50 cars waiting at the barricade when we heard an ambulance siren behind us. Everyone decided to move their cars in the left lane to allow the vehicle to pass. However, the cops stopped it when it reached the barricade.” This video has received over 20K shares on Facebook. ← Priyanka’s edited old photo is viral with crucifix added. ​क्या कोहली ने ये कहा बीजेपी के लिए? That’s NOT IAF Pilot Abhinandan dancing with Pakistani Soldiers. March 1, 2019 Hoax Slayer Comments Off on That’s NOT IAF Pilot Abhinandan dancing with Pakistani Soldiers.